With those credentials it isn’t surprising that Jen was recruited by many colleges. However, it was the storied history of the Villanova program that led her to the suburbs of Philadelphia to continue her running. Her start at Villanova wasn’t what she envisioned. Her frosh cross country campaign ended with a 98th place finish at the NCAA championships. The team won but she didn’t contribute to the team score and it bothered her…..a lot. She recognized the problem and made changes. The following year she placed second then her junior year she was the NCAA Cross Country Champion. While at Villanova Jen was a five-time NCAA champion. Added to her cross country title is the outdoor 5000 three consecutive years (94-96) and the indoor 5000 in 1995. Jen graduated with a degree in civil engineering in 1996. To say that things got better for Jen after she left Villanova would be an understatement. She went on to qualify for three Olympic Games. In 2000, she qualified in the 10,000 then the marathon in 2004. In 2008, she qualified in the 5000 in an epic battle against Shalane Flanagan and Kara Goucher in what some say was the greatest women’s Olympic Trials 5000 race ever. Jen’s professional career includes her breaking the elusive 15-minute barrier in the 5,000. Her 14:54.29 makes her the 5th fastest American performer ever at that distance. Her 31:17.31 10,000 makes her the 9th fastest American performer ever. Her 3000 best of 8:35.03 makes her the 6th fastest American performer ever. It’s very difficult to make one Olympic team. It’s rare to make a second. It puts you in a very elite group of people when you make three Olympic teams. 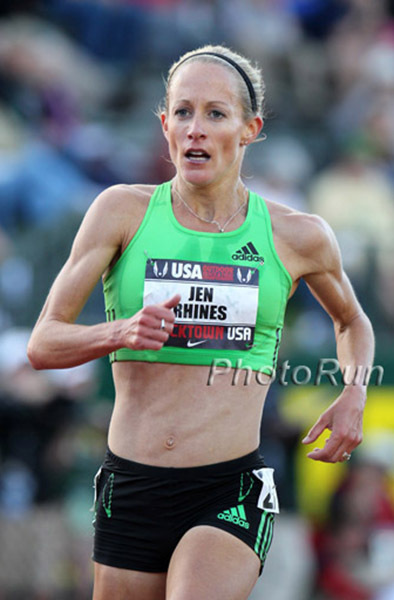 In 2011, 15 years after graduating from college, Jen finished 9th at the World Championships in the 10,000 meters. Her success and longevity in this sport is amazing and the envy of other elite athletes. She is truly one of America’s greatest distance runners ever. You will meet her at Aim High.